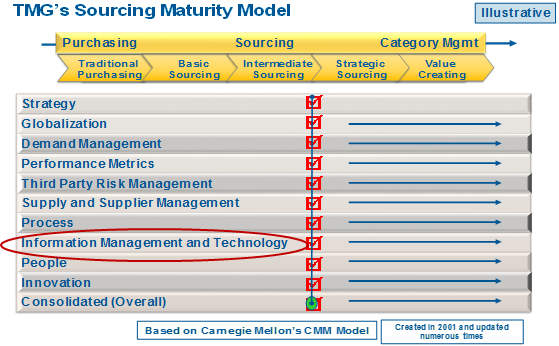 Our webinar series on “The Journey from Strategic Sourcing to Category Management ” continues it’s very successful run and the next one on August 22nd is going to focus on Process and Information Management & Technology. As usual, we will be following our Maturity Model to frame the conversation but before I get into the details, let me make a couple of quick observations for your consideration. The most important factor missed in most technology discussions is that it’s not the technology that drives value creation, it’s the adoption of the technology. Two different companies will get drastically different value realization from the same exact software. The second is that very often our function fails to get technology investments justified because we rely solely on savings and fail to include the Value Drivers of our stakeholders. Data analysis/mining leads to breakthroughs in quality, delivery, cost & risk management –Too much data is worse than not enough data and alumni of our Strategic Sourcing / Category Management “U” will fondly remember the simulation that painfully proves that. Organizations at the highest level of maturity ensure that Big Data creates actionable intelligence and not analysis paralysis. The discipline required to achieve this attribute is critical because we have all been conditioned to keep gathering more and more data. Transactional data transparency allows books to be “closed” ad-hoc to generate real-time performance metrics-This is often an overlooked benefit of technology investments in our function primarily because we have not cultivated a culture of rapid response based on rapid receipt of information. Our organizational inertia and slow decision processes get in the way and yet this can be one of the highest value adds from technology. Paying for getting information faster is a waste of money if we cannot use information faster? Competitive business advantage lies not in the purchase of technology (which can be copied) but rather in the integration of business processes to eliminate waste & manual intervention.-Too often we see technology implementations at clients without proper attention to integrating them with business processes and thus driving efficiency. In fact, it’s this integration that will help them achieve the reduction of manual activities that are part of their business case. Many will insist on preserving their current processes and in doing so, end up reducing the value realization from their technology investments. Approached by technology suppliers for introducing innovation based on your track record-A subtle but critical attribute because there is real value and competitive advantage in being the recipient of the latest technological innovations from your technology suppliers. They are looking for the best customers who are rock stars when it comes to implementing and adopting technology because it is those clients that will prove the worth of the innovations and realize the most value. Clients like that are the best references for further market penetration. So being chosen by your technology partners means you are generating true competitive advantage for your company. Unfortunately, our function still continues to lag behind in getting support for technology investments. However, those organization who have reached the highest level of maturity seem to not suffer from this dilemma and it’s clearly because they share a number of the attributes listed above and the additional ones we will be discussing during the webinar. 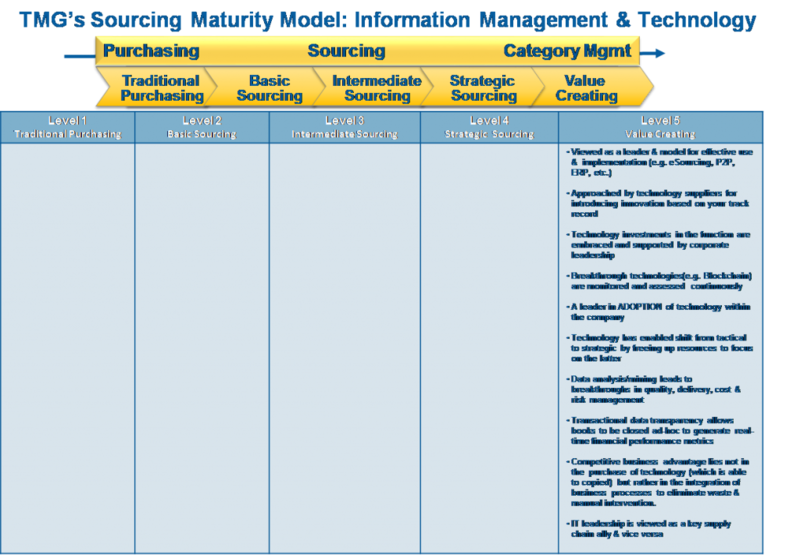 Technology is not a panacea for all ills but applied judiciously and with a focus on adoption and not just implementation and deployment, it has allowed many sourcing and supply chain organizations to leapfrog their competitors and make the shift from a tactical back office function to a strategic business partner. Join us on August 22nd to learn more about how to achieve the same level of success. Previous ArticleNegotiating Styles – Which One Works Best? Next Article Do You Know the Difference Between Strategic Sourcing and Category Management? Try Our Webinar!! !